I got a message that says I must return to my LMS. What does that mean? If your school uses a Learning Management System (LMS) called Canvas, you must click the corresponding chapter link before entering that webtext chapter. This is how your grades know how to get back in Canvas, where you and your instructor can see them. Without clicking the link, your completed work will not be reflected when you view your grades. If you use the Table of Contents in the webtext to navigate to Chapter 6, for example, and you have only clicked on the LMS links through Chapter 5, you will get a message telling you to go back to your LMS and click the link for Chapter 6. In the image below, you can see the link labeled “this page.” If you click it, it will take you back to exactly where you need to go in your LMS. If this link is not clickable (because your instructor has not opened it yet, or because your instructor has closed it already), then get in touch with us. 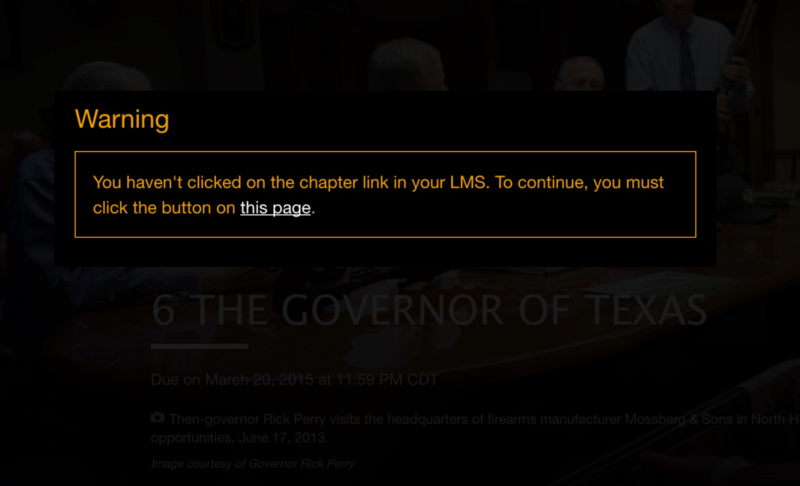 To prevent this message from appearing in the future, do not use the Table of Contents to navigate to a chapter without first clicking the LMS link. If you need to get rid of this message quickly to complete your work before a deadline, you can hit the Escape (esc) key on your keyboard to clear it. However, you must contact us as soon as possible so that we can make sure everything is linked correctly. Otherwise, your points may not reach Canvas before the due date.